The Gables Hydro Hotel, Orchard Road, St.Annes-on-the-Sea. 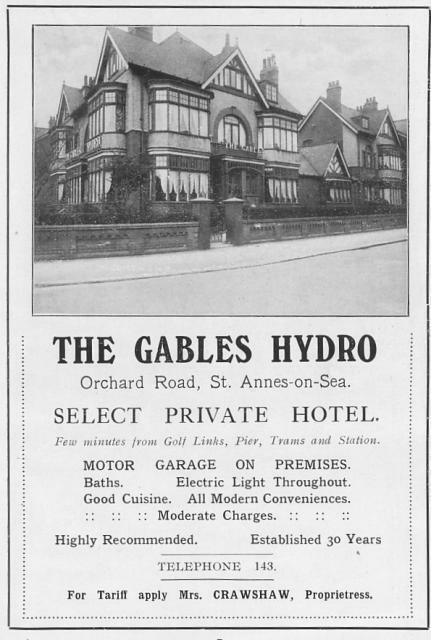 Advertisement from 1924 for the Gables Hotel, Orchard Road, St.Annes-on-the-Sea. Miss Tuke owned "The Hydro", a hydropathic establishment in St.Annes Square during the mid-1890s but this building was to be converted into much-needed shops for the rapidly growing resort. Because of this she had "The Gables Hydro" built on the corner of Richmond Road & Orchard Road in 1907. Hydropathic treatments were going out of fashion by the 1920s and it was renamed "The Gables Hotel". The hotel closed in 2005 and was demolished in 2008. 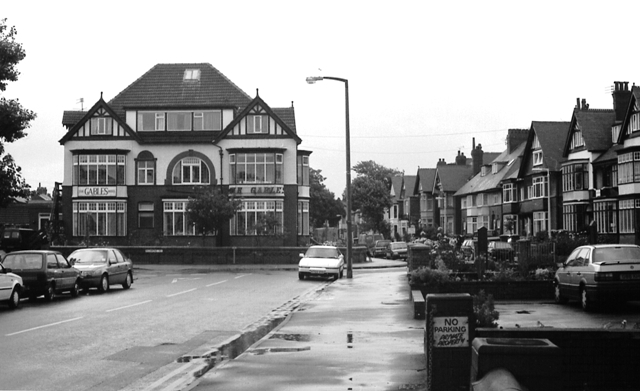 The Gables Hotel, Orchard Road, St.Annes-on-the-Sea, in the 1990s.